Filet Mignon is one of my favorite main courses to cook because it is simple, easy and elegant. The best part of getting a good cut of beef is selecting a side dish to accompany it. When cooking a filet, I usually pick a side dish that has something do with potatoes. I think if I had to pick three foods to be stuck on an island with I would choose cheese, potatoes, and chocolate. I am not really sure what I would make with these on the island, but they do represent my three favorite "food groups" if you will. I decided for this meal to pair the filet with an easy twist on home fries, adapted from a Martha Stewart recipe. You will need the following: potatoes, shallots, parsley, and some Pimenton or smoked Paprika. First heat some butter in a skillet. When the skillet is hot add the potatoes (cut into wedges) and cook until they start to brown a bit on the edges. This can take anywhere from 5 to 10 minutes. Once the potatoes start to brown, I add some salt and shallots. I like to cut the shallots into rings, although you could also dice them. If you don't have shallots, you could substitute in any type of onion. I like shallots because they are pretty, purple and have a nice mild, sweet taste. It is surprising how much the shallots will cook down and reduce. Pictured above I have added about two whole shallots. They will eventually reduced by about half. I cook these on a medium heat for about 8-10 minutes. At this point the shallots should be softened and slightly browned. It is now time to add the "secret" ingredient that gives this dish a little kick, the Pimenton/Paprika. I add about 1/2 to 1 table spoon of Pimenton to the dish. I think for this step it is important to taste first and see what level of spice you are comfortable with. The nice things about Pimenton is that is has a sweet, smoky taste, so it is hard to use too much of it. Once you add the Pimenton stir with a wooden spoon and let the dish cook for another 8 minutes. Warning: if you have a Springer Spaniel puppy on the loose, be careful to keep an eye on the dish and not the puppy! William was out and about while I was cooking and my husband was setting the table. I must admit that I over cooked this dish a little more than I would have liked! When everything is done, add about 2 tablespoons of parsley. I like to use chopped Italian flat leaf parsley. It adds a lovely dash of color to the dish! Now on the the meat of this dish, the filet! I usually ask the butcher to cut the filet about 1 inch thick. My rule of thumb for cooking filet is to cook it for approximately 4 minutes on each side for medium-rare (my preference) steak. I usually grease the skillet first with a little olive oil and heat until the meat makes that great "sizzle" sound when you lay the steaks on. I prepare the fillets beforehand with a bit of olive oil and mix of McCormick Montreal seasoning and Lawry's seasoned salt. Sometimes I make a red wine reduction sauce to pair with the filet. If this is the case I use just some sea salt and coarse pepper for the filet to keep things simple. Here is the finished product! 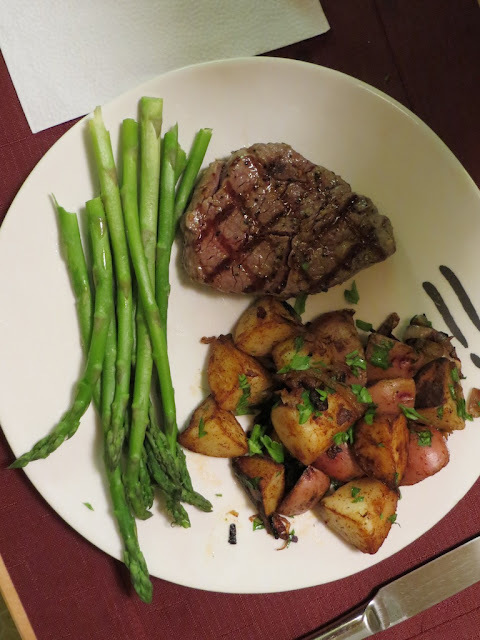 Nothing beats a nicely cooked filet, classic potatoes, and fresh steamed asparagus. Although, I think my favorite part of a nice steak dinner is pairing it with a good bottle of wine. Last night we had a bottle of Provenance 2007 Merlot. Bon Appetit! Omg. Now I want steak! Thanks for posting this!